This homemade vegan pasta noodle recipe is easier than you might think. I’m not telling you that there’s no work involved in making pasta, but most of the effort is in rolling the pasta out. What Are Pasta Noodles Made Of Anyhow? 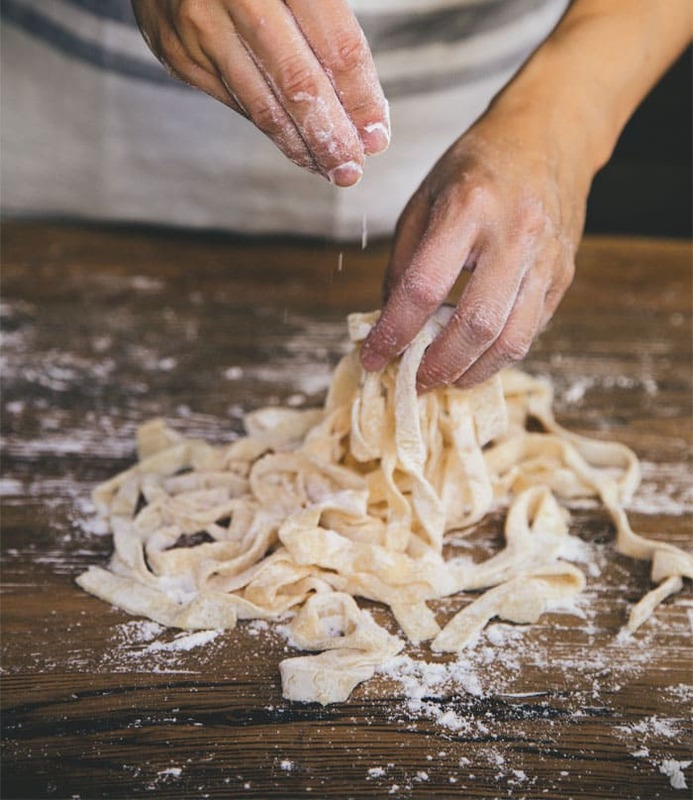 Pasta dough recipes are typically made with wheat flour, usually semolina flour, water, plus eggs in non-vegan pasta. In this homemade vegan pasta recipe we use a combination of semolina flour, all-purpose flour, water and absolutely no eggs. You can also use whole wheat flour in this recipe if you want. Just Looking for Vegan Pasta Recipes that Aren’t Noodles? Check out some of these recipes that use vegan dried pasta! Does All Fresh Pasta Contain Eggs? You may be wondering if vegans can eat pasta. Most of the time fresh pasta is made with eggs, so if you’re buying it pre-made be sure to read the label carefully. But there is eggless pasta. On the other hand most dry pasta is traditionally made without eggs, but I’ve noticed that some fancier dried pasta also has eggs, so read the ingredients carefully no matter what type you buy. Check out dry pasta if you are looking to grab some at the store. You can also make egg-less pasta using the recipe at the bottom of this post! Can You Make Gluten-Free Vegan Pasta? It’s possible to make gluten-free pasta, but not with this recipe. Try my recipe for Quinoa Flour and Flax Gluten-free Noodles if you’re allergic to gluten. I love the recipe from The Homemade Vegan Pantry like this Easy Vegan Pasta recipe! 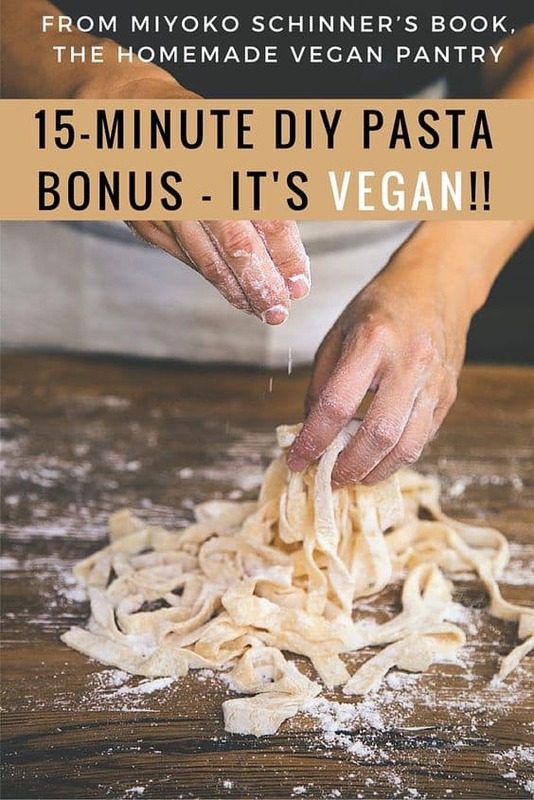 How Do You Make Homemade Vegan Pasta? It’s really the same process as egg pasta dough, but I love that Miyoko makes the dough in the food processor since that can be a little hard on my wrists. The food processor makes short work of it. Do You Have to Have a Food Processor to Make Vegan Pasta Recipes? If you don’t have a food processor you can make it the old fashioned way by mixing the flours together in a pile on a cutting board. Then make a well in the middle of the flour, add the water, then gradually mix together with your hands. You can buy a manual pasta machine to roll the vegan pasta dough extra thin, but the rolling pin you have at home will work just fine. 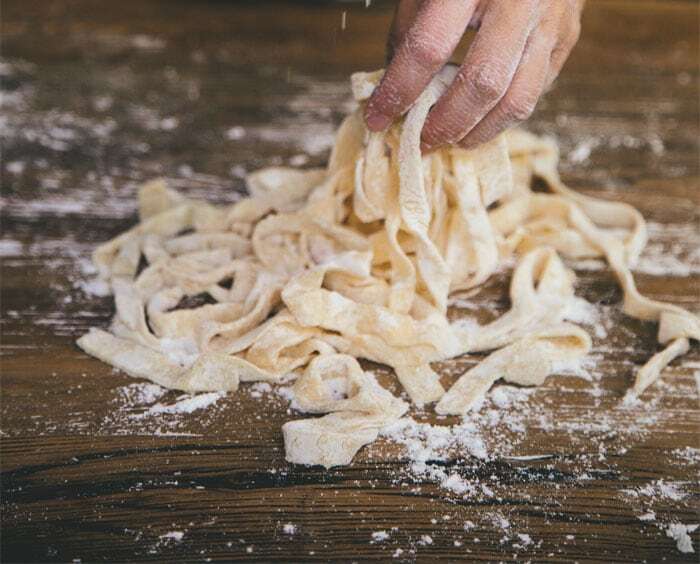 Have you made homemade pasta before? If so, tell me how it went for you in the comments! 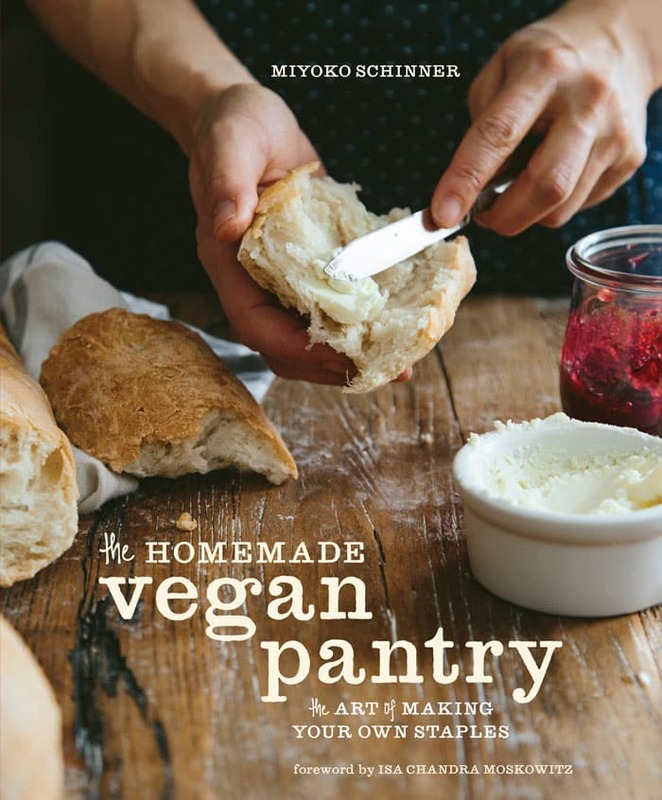 Reprinted from The Homemade Vegan Pantry: The Art of Making Your Own Staples with permission. Probably the best place to learn how to make pasta is Italy. But if you want some homemade fettuccine tonight and aren’t in Italy and don’t have a pasta machine, here’s the recipe for you. Start to finish, it’s a 30-minute dish, including about 15 minutes of rest time. 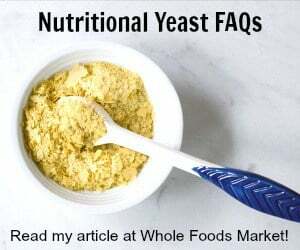 Put both flours in a food processor. Put the lid on the food processor, turn it on, and slowly pour the hot water through the spout. The mixture will first look like cornmeal, then form tiny little balls whirling around the work bowl and, finally, after a couple of minutes, form a big ball in the middle. Let it go for another 30 seconds to knead the dough, then turn it off. Remove the dough. It will be quite warm and pliable. Flatten it out into a 1⁄2 -inch-thick pancake, then cut it into quarters. Cover the dough with a dry towel and let it rest for 10 to 15 minutes. Sprinkle some semolina or all-purpose flour onto a clean, dry surface and put one of the four pieces of dough on it. Using a rolling pin, roll it out as thinly as you can (it will expand as it cooks). You can make it as thin as an envelope with a card in it, or as thick as 1⁄8 inch, which will create a chewy, rustic, country-style pasta. After you’ve rolled out all of the sheets, use a sharp knife or pizza cutter to cut them as desired, one sheet at a time. You can cut them into any width that will suit the sauce of the evening, whether spaghetti, fettuccine, pappardelle, or lasagna. Get that large pot of salted water boiling (about 8 cups), then cook the noodles for 2 to 3 minutes, until perfectly al dente. Serve with a sauce of your choice. To store the pasta, toss it with a little semolina or flour to prevent sticking, then wrap in plastic wrap or put in a covered container and refrigerate for 2 to 3 days. WHOLE WHEAT PASTA Substitute 1 cup whole wheat bread flour (not whole wheat pastry flour) for the all-purpose flour. « Instant Pot Vegan Menu Plan: Quick Back to School Meals that Wow! Yes, I have made pasta at home, from 100 percent whole wheat flour, but not in years. We loved it! You’ve inspired me to give it another go. One drawback for me has been that I had no pasta dryer on which to hang the noodles after cutting, as my grand-aunt did when she made pasta. I always thought it a requirement. I’ll try your method, without improvising a drying rack. Just drop those lovelies in the boiling water. Can’t wait to try it again! Thank you. My parents used to always use broom handles set between two chairs! Making fresh pasta is one of my new year’s resolutions. Thanks for the recipe. I saw yesterday a pasta on the television made of 300 gram all purpose flour and 200 gram spinach. That made me search for more vegan pasta recipes and found yours. My children and I deserve the best, so no more shop bought pasta anymore. How did you prepare the spinach when you use it? I’d love to find out and make it myself. We purchase a variety of pasta’s that use vegetables with the flour and really enjoy them! Thank you, in advance, for taking the time to share your process! Fantastic! Thanks so much. I bought a pasta machine a few weeks before I went vegan, then found all the recipes called for eggs. I buy fresh pasta every week at the farmers’ market. They recommend freezing what you can’t use in a few days. It’s worked for me. This would make a GREAT party theme– gather people, open a bottle of wine, whip up some batches of pasta dough, drink wine while it rests, get everyone rolling theirs out, cutting them up, etc. Sounds like a blast. Wonderful idea, thanks for sharing it!!! I can hardly wait to try the recipe. mmmmmmm homemade pasta…I am so there! I will return to rate it after making it. When putting the flour & water in the food processor, are we supposed to use the “S” blade? I don’t have a plastic one, just the one that came with the unit originally. I use the metal one myself. Cook the noodles for ?? to 3 minutes? I think something is missing in sentence 4-5. That’s 2 to 3 minutes. I loved this recipe from the start…but am not a fan of rolling and cutting. So last night I tried running the dough through my Omega juicer, which has attachments for extruding different sized pasta (basically, a large ‘bolt’ pushes the dough through holes to create the pasta). I had been concerned that the dough wouldn’t hang together, but I was totally wrong. It made fantastic spaghetti sized noodles and in half the time of rolling and cutting! Now I love this recipe even more, THANK YOU! Is there *any* way to make this gluten free and have it work? I own this book and the good need is she DOES include a gluten feee pasta recipe! It’s a great book. I’m currently in the process of making a gluten free recipe. Using 2 cups gram flour and 1 cup GF plain flour! I made it once and loved it, and when I got familiar with the texture and process, I added italian herbs and red pepper flakes to the dough mix and it really made some tasty pasta. I then tossed it in a tiny bit of white truffle oil and Parmesan. Perfection. I’ve never made pasta before and Gia was very easy, thank you again for sharing! Hi, this recipe looks amazing! Do you have any recommendations on how to prepare this by hand, without a food processor? Thank you! You’ll just knead the dough by hand. It will take longer, but taste just as good. I don’t have that list anymore – so sorry!